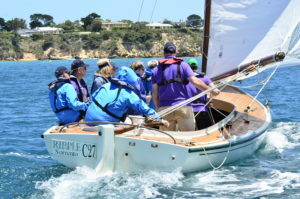 Members, guests and visitors to the Club can now enjoy a day out sailing aboard Ripple. From the deck of Ripple you can explore Port Phillip’s vast coastline, world-class swimming beaches and coastal parks. Sip a glass of champagne whilst enjoying the breath-taking views of the clifftops of Sorrento and Portsea. Enjoy seeing dolphins, fairy penguins, seals and all manner of aquatic life in the crystal clear waters of the southern end of the bay. You never know who will pop past for a visit while Ripple is out exploring. With champagne in hand, cruise along the coast line to an anchorage off Point Nepean National Park. Either sit back and soak in the atmosphere or get your hands salty and take charge of Ripple. Whatever you choose your experienced skipper will make sure it is a spectacular experience. Mum and dad together with the kids can go sailing on Ripple. 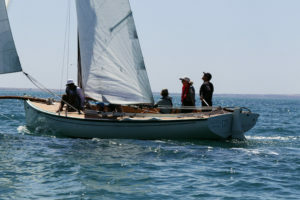 This is a great way to discover sailing as a family. Once you have caught the sailing bug we offer sailing courses tailored to suit both adults and children. Choose from one of our delicious hampers, sit back, relax and take in the stunning Peninsula coast line. Get the team together! You will need to work as a team to raise the gaff, trim the sails and steer your course to make the mighty Ripple rumble. We can tailor the day to suit your requirements, provide catering and rooms are available at the Club for onshore activities. Arrive at your wedding aboard Ripple. Forget fancy cars, this is the way to truly make an entrance. Ripple is also available for other special celebrations and can carry up to 8 guests. A skipper and host are provided to make sure you enjoy the occasion. If you would like to do something a little out of the box we will do our utmost to fulfill your requests. There are opportunities to charter multiple Couta Boats for larger parties – please don’t hesitate to contact the Club to discuss your custom adventure. If you have ever been interested in learning to sail a couta boat or are interested in upsilling your couta boat sailing, these courses are conducted in SSCBC’s Couta boat Ripple and run for 3 hours over four days, 12 hours in total for each course. Further details are available here. To download our Ripple brochure, please click here. For further information please contact the SSCBC office.